Most pet parents understand the importance of exercise, but few understand how important mental exercise can be for their dog. Just like “a tired dog is a good dog,” “a bored dog is a mischievous dog.” Read on to learn how to get your dog a mental workout! Fortunately, you can do many different things with food to help your dog spend his time doing what comes naturally, rather than choosing activities that might not be to your liking! Tricky Treat Ball and Food Carrier Toys Tricky Treat Ball, Buster Cube, Molecuball, Kibble Nibble, Treat Stik or feeding balls are toys that release bits of kibble as your dog plays with them. These are great food puzzles for your dog, and are also pretty tough so should hold up for many years of play. “Hide the food” games involve using food carrier toys such as Kongs or hollow bones ﬁlled with your dog’s food. Hide these items in different locations so he must “hunt” down his kibble or treats. Save those disembowled stuffed toys that your dog enjoyed just long enough to get the cotton ﬁlling out, and use them as casings for food, treats, bones, other toys, balls, or a combination of them all. This will give your dog a familiar toy, but now it will be all full of great things! Old socks can be knotted and stuffed using the same sorts of things. An old Quaker oatmeal canister (or some other cardboard container), with a couple of holes poked in it and several goodies inside, can make a great “new” toy for dogs that enjoy the feel of paper products in their mouths. Most dogs will tear these up after a time, but who really cares if it keeps important things out of your dog’s mouth? Cut the handles off of a paper grocery bag and make your dog a doggie trash can ﬁlled with fun stuff he can shred, eat, or chew on. When I was teaching my dog Stitch to be a good “home alone” dog, I would put some dry dog food, a few crumpled up pieces of paper, a rawhide, a few treats, a toy, and several items in a bag and then leave it on the ground for him as I left. Kongs are wonderful for feeding meals or to give just for a special treat! A well-stuffed Kong can keep a dog busy for quite some time, and he will expend mental and physical energy while he works on it. REMEMBER: Some foods are not healthy for dogs. When in doubt, check with your vet ﬁrst. As you create recipes and experiment with ideas, make sure to be sensitive to your dog’s tummy by introducing new foods gradually. What follows are some recipes created by veterinarians, dog trainers, and dog lovers worldwide. Use these fun recipes or just mix wet and dry food together and ﬁll your dogs’ kong. -PHILLY STEAK: steak scraps · 1 ounce cream cheese · appropriate Kong Toy Place small scraps of the steak inside Kong toy. Spread cream cheese in large hole to hold scraps. -VEGGIE KONG OMELET: 1 egg · your choice of shredded cheese · any vegetables that your pet may like · appropriate Kong Toy Scramble egg and fold in vegetables. Put into Kong toy. Cool thoroughly before giving to dog. -AUNT JEANNIE’S ARCHEOLOGY KONG (for advanced dogs) LAYER ONE (deepest): roasted, unsalted cashews · freeze dried liver bits LAYER TWO: dog kibble, cookies or liver biscotti · Cheerios · sugar-free, salt-free peanut butter · dried banana chips, apples and apricots LAYER THREE: carrot sticks · turkey or leftover ravioli or tortellini · Kong Toy (the larger the better!) Pack as tightly as possible. The last item inserted should be an apricot or piece of ravioli, presenting a smooth “ﬁnish” under the main opening. For those dogs that like the hard surfaces, rawhides that have had the crevices ﬁlled with little treats or peanut butter or cream cheese make a great long-lasting chew. Nylabones can be smeared with the same sort of treats for a similar purpose. 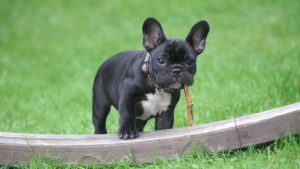 Chewing on appropriate items such as pressed rawhides helps relieve stress and provides exercise (mental and physical) while also keeping your dog’s teeth off things he should not chew. There are numerous varieties you can buy that will provide hours of chewing fun. However, you will need to consider your dog’s chewing style before leaving him alone with any chew. Dogs that devour a rawhide in just a few moments should not be given most types of chews when left unsupervised. Not only can chew treats give your dog diarrhea if large amounts are ingested quickly, if your dog is able to get large pieces off they may become lodged in your his digestive track if swallowed whole. This is the type of chewer that will need some more creative toys that will hold up to a strong jaw.